With a brand-new college and career academy set to open this fall, businesses adding new jobs to their payrolls, and a local physician investing big money into a downtown venture, there’s a lot to be optimistic about in the Good Life City these days. Building on educational offerings, expanding existing industry and potential revitalization efforts downtown are all on the books for Albany and Dougherty County this year. However, excitement for the new year was short lived in the area when straight-line winds struck during a devastating storm Jan. 2, uprooting centuries-old live oak trees and sending thousands of pines crashing down on homes and businesses. As Albany was still reeling from the first storm, two weeks later a deadly tornado claimed five lives in Dougherty County and left hundreds more Albany families and businesses to deal with devastation and, in many cases, total loss. 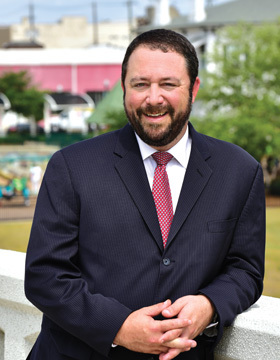 Dougherty County Commission Chair Chris Cohilas, whose own home was struck in one of the neighborhoods hardest hit, had to plead Dougherty’s case over and over before the disaster received coverage from outside news sources and help began to trickle in. Cohilas says that’s a figure easy to reach when you consider the more than $300 million in losses and replacement costs at the Marine Corps Base in Albany and $650 million in losses and replacement costs to other large industries. Add to that the state insurance commissioner’s projected $30 million in individual insured claims after the first storm alone, additional losses such as uninsured timber and irrigation pivots for farms and the loss of business revenue from being without power for up to 14 days. Today Cohilas and other city and county leaders are engaged with the governor’s office, the Department of Community Affairs, the Georgia Economic Development Commission, the Georgia Chamber of Commerce and other players to develop some long-range strategic planning. The county has also hired the top lobbyist in the country for disaster recovery to help guide them through the process of bringing federal emergency funds to the county, he says. “Ultimately, how you recover from this type of event and make your community safer, stronger, more efficient, more economically resilient and your infrastructure more reliable and capable of supporting more … you’ve got to have some significant investment from Congress,” says Cohilas. Business isn’t the only part of Albany that was affected by the storms. The only accredited art museum in south Georgia, the Albany Museum of Art, suffered an estimated $1 million in damage. Every piece of art had to be relocated to either Chicago or the High Museum of Art in Atlanta for storage or restoration. Renovations to the first floor should be complete by Labor Day, enabling the museum to return to partial operations. In the meantime, the museum’s board of trustees is exploring the possibility of relocating the museum to downtown Albany near several other museums and attractions. The potential move would serve to create a museum district in an area historically challenged by revitalization efforts. Last summer, Hamilton Relay Inc., a national leader in the telecommunications relay and captioned telephone services industry, announced completion of the reconstructing and remodeling of its 7,200-square-foot Albany center and the addition of 75 new positions. Six months later, the first storm to tear through Southwest Georgia totaled the facility. Company executives could have elected to shut down their Albany operations but instead opted to set up shop in two temporary facilities. They were encouraged to stay by the property owner, Carter Properties’ Wayne Carter. “He quickly worked with the insurance folks to make a determination that he did indeed want to rebuild, and he committed to doing so very quickly,” says Dixie Ziegler, vice president of Hamilton Relay, adding that the decision to stay in Albany wasn’t a difficult one to make. Three months later, Hamilton Relay employees were back in their permanent facility and today run two shifts with about 173 full- and part-time workers. The company is currently looking to hire about 50 more, says David Castellano, manager of the Georgia center, adding that support from the local community, including the chamber, the economic development commission and other businesses, has been encouraging. Locally owned agriculture planes manufacturer Thrush Aircraft announced in late April it would expand its workforce by 100 new jobs over the next three years, primarily in production and quality control. Thrush airplanes have been produced in Albany since 1965 under several corporate names, and the company today employs more than 270. There are currently more than 2,100 Thrush aircraft operating in some 80 countries. “We’re coming out with several new product lines, which is driving demand, too,” he says. New product lines include a patrol plane used by the military. Albany has always been home to Thrush, and Hughes likes it that way. Albany Technical College’s Center for Business Solutions recently launched a new technical certificate of credit program, Industrial Operations Technician, to help meet a growing local demand for this workforce. The program was the result of a partnership between the college and the Technical College System of Georgia, along with the Albany-Dougherty Economic Development Commission (ADEDC) and the Albany Industry Roundtable, a CEO-level forum of major manufacturers and distribution centers in the county. Students enrolled in the two-semester program will gain exposure to a number of manufacturing principals, including operations management, industrial mechanics, interpersonal skills and Lean Six Sigma, a waste reduction program. Seventeen students graduated from the first class this spring, another 37 are currently enrolled and 21 have pre-registered for next semester, says Matt Trice, vice president of economic development programs at Albany Tech. Also new to Dougherty County is the Commodore Conyers College and Career Academy that will open its doors to about 400 students this fall and twice that many in 2018. CEO Chris Hatcher will head the program and is excited about the opportunities this new offering will provide for area high school students in Dougherty and neighboring Lee, Calhoun, Baker and Terrell counties. “Students will be able to learn about career opportunities in our region and state from industry professionals coming in to talk about different careers and access to internships and apprenticeships. It will help students determine what pathway they’ll take,” says Hatcher, adding that students will learn soft skills such as work ethic, collaboration and problem solving in addition to a curriculum focused on any of 17 career pathways. “They’ll be able to take advantage at an early age and finish high school with an associate’s degree at no cost,” says Hatcher, a longtime Albany businessman. The projects they successfully went to bat for include the $4.9-million phase II of the Carlton Construction Academy at Albany Tech and funding for the Southwest Georgia Medical Student Housing Complex, a shot in the arm for Phoebe Putney Memorial Hospital’s Family Medicine Residency program and others that bring medical students to train in the Albany area. The chamber also worked with ADEDC on a business assessment needs survey sent out after both rounds of storms and hosted an event in June, After the Storms – Commerce and Community – to tie everything together. “Under one umbrella, at one time, we [could] share with our community where we are, where we’re going and what the opportunities are,” she says. One opportunity presenting itself to downtown Albany is Pretoria Fields, a farmhouse microbrewery being developed by local physician Joe“Tripp” Morgan III and slated to start pouring this fall. What began as a way to find a niche for the local farm he operates with his father has grown to include a brewery and beer garden in an area of downtown Albany where growth has been slow and sporadic for decades. After local zoning regulations made putting the brewery on his farm difficult, Morgan was approached by city leaders about locating the business downtown. Thanks to a state law changing Sept. 1 of this year, visitors to the brewery will be able to come in just to drink beer and socialize or take a tour of the facility and see the process of craft beer making. Pretoria Fields will initially employ about seven people and will increase to 14 to 20 for event staff, says Morgan. Back on the farm, ongoing agritourism efforts continue to draw locals and visitors alike to the organic farm Morgan operates as a collective – a hops project is in operation and other grains are being grown not only for Pretoria, but also to sell to other breweries around the state, says Morgan. Another boost for downtown Albany is the mixed-use Flats at 249, the first major residential development in the downtown district. Local developer Pace Burt is renovating the former Albany Heights building to create studio apartments above retail space. He’s offering the retail space rent-free to encourage business owners to locate downtown. Burt has apartment complexes in Albany and has done similar residential projects in Columbus and in South Carolina. In all, Albany is rising above the storm devastation to reinvent and revitalize itself with renewed energy and investments. Most think of retirement as a time to kick back and relax. But for Albany’s Kirk Rouse, now 66, retiring after 30 plus years as a partner in a general insurance agency gave him the freedom to foster the career he really wanted: professional chef. Rouse’s interest in all things food began in college, where he was introduced to international cuisine. Friends there gave him his first cookbook – Earth, Fire, Water, Air – launching Rouse’s desire for culinary education and experimentation, including classes he took in the 1980s from a French neighbor who’d trained in France. Throughout the ’80s and ’90s, Rouse was front and center at classes in New Orleans, Mexico, Argentina and Provence, France. He attended San Francisco’s California Culinary Academy and even studied a week under Julia Child in Cambridge, Mass., all while building his insurance career. Late last year, Rouse set off on a Paris adventure to the mother of all cooking schools – Le Cordon Bleu. There he endured an intense six weeks, sometimes spending 14 hours a day between kitchen and classroom, to earn a certificate in basic cuisine. “To me French cooking is simple: It’s about focusing on the flavor of your main ingredient – whether it’s beef or asparagus – rather than overpowering with sauce or spices,” says Rouse, who is also interested in the health and nutrition aspects of good food. This fall he’ll return to Paris as one of 25 students chosen annually from around the world to attend the Hautes Études du Goût’s institute of advanced studies in taste, gastronomy and arts of the table, offered in collaboration with Le Cordon Bleu and Reims University. He’ll wrap up 2017 with a course on bread, rolls and pastry at École Ritz Escoffier Paris. “At some point I’ll want to just focus on sharing what I’ve learned,” says Rouse of his constant pursuit of culinary experiences. In the meantime, he’s overseeing a highly successful supper series fund-raiser for the Albany Museum of Art and hosting his own pop-up dinners, which sell out immediately to lucky diners who get to enjoy a French meal in a secret location.